New Perspectives Issue 02/2016 Out Now! Browse: Home » 2016 » December » 31 » New Perspectives Issue 02/2016 Out Now! New Perspectives – 02/2016 – Out Now! We are delighted to present issue 02/2016 of New Perspectives – our subscribers have access to the full contents of the journal, which are listed and linked-to below. However, we are also very happy to be able to offer free, open access to Derek Sayer’s fascinating review essay (see below) as well as the Editorial, which, for the first time split into two parts. Roland Bleiker provides a moving and illuminating tribute to the brilliant and pathbreaking Alex Danchev, who passed away in 2016. Scholars like Danchev and Bleiker helped inspire the creation of New Perspectives and I draw extensively on their work in defending and advocating adventurous, interdisciplinary scholarship of the kind that our journal promotes. You can download these pieces as they appear in the journal from this post (click on the links below) or read them online. Subscribers get access to the full issue, which is also available through the EBSCO, Proquest and CEEOL databases – make sure that you or your institution subscribe or have access through the databases to avoid missing out on cutting-edge research and analysis on issues that affect us all. Juha Vuori makes a compelling argument about how we mainly get deterrence wrong and how we can do better. We’ll be sending a copy of Vuori’s ‘Deterring Things with Words: Deterrence as a Speech Act ‘to the incoming US Administraton – we don’t know if they’ll read it but anyone wanting to be up to speed with the latest in deterrence theory should. In light of current geopolitical upheavals and the EU’s troubles in its Eastern neighbourhood, policymakers as well as scholars would be well advised to read Molly Krasnodębska’s novel analysis of the tensions that are built into the Union’s ‘Eastern Partnership’. Rather than focusing on the tensions between values and interests that has recently characterised discussions of the EU’s approach, Krasnodębska focuses on different conceptions of values from the partnership’s key players – Sweden and Poland. We thus throw Armand’s literary work into constellation with various forms of scholarship, with the the visuality and creativity of Danchev and Bleiker, Sayer’s indisciplined historical sociology, Vuori’s linguistics and Krasnodębska’s political philosophy. We do so in the hope of encouraging new ventures in both how and what we seek to understand or explain, but also to reflect on and experiment with the ways in which we represent our ideas and analyses. We not only have our first ‘cultural cut’ but also publish photographs for the first time in the journal’s history. We look forward to your engagement with this issue and to your brilliant and pathbreaking submissions for future issues. In a recent conversation I was asked why New Perspectives aspires to be an ‘Interdisciplinary Journal of Central and East European Politics and International Relations’ and, as a follow up, what was the value of this interdisciplinarity for IR scholars when “no one cares what you publish in a critical geography journal […] no one at the ISA is going to pat you on the back and say ‘nice piece’ if you publish it out- side of IR. No one cares.” That this was the attitude to interdisciplinary of one of the leading lights of International Political Sociology (IPS), a potential IR ‘master in the making’ is worrying, to say the least. And not just for us here at the journal. 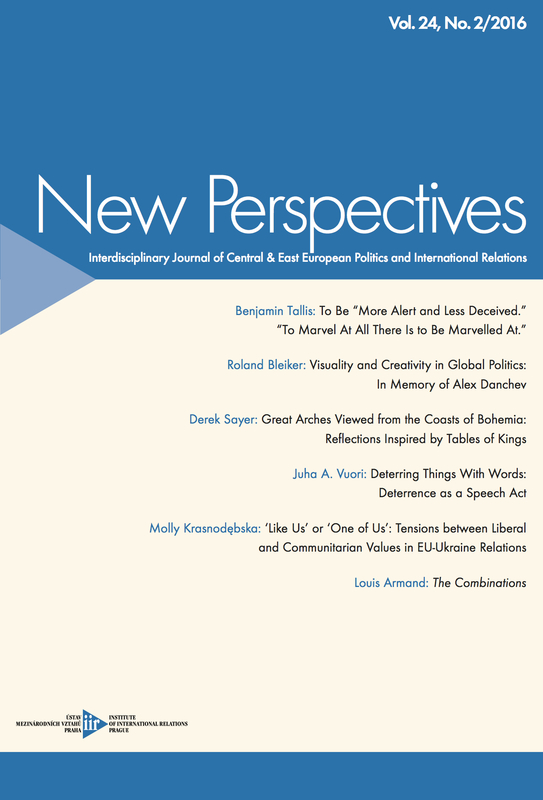 In this issue of New Perspectives, I share the space normally allocated for the Editorial with Roland Bleiker, who provides us with a stunningly moving and still raw, yet rich and nuanced tribute to the brilliant Alex Danchev, who passed away in August, all too soon. Like Danchev’s entire oeuvre, his entire career, Bleiker’s piece provides an elegantly stinging response to the questions posed above and to what they represent in contemporary IR scholarship (although unlike those critical IR scholars who often imagine the grass is so much greener elsewhere, I don’t doubt that such attitudes have their correlates in other disciplines too). I have never had a harder time beginning a text. I mould and remould my words, I mix and remix them, I discard them and search for new ones, again and again, but no matter what I do, it all sounds wrong. Where to start? With lamenting that his death, in August 2016, was unexpected and untimely and impossible to understand and accept? With noting that he will be dearly missed – by his family, by his friends, by his colleagues; by his students, by his readers, by me? Or with highlighting the key moments of his career, from his education and his time in the army to his professorships at the universities of Keele, Nottingham and, most recently, St Andrews? This is not my task. Numerous obituaries have already done so in detail. I would, instead, like to offer a personal appreciation of Alex as a person and as an international relations academic. He was one of the most generous, genuine and cre- ative scholars I have ever met – a true role model in every sense of the word. As Cold War historians and fans of the film Doctor Strangelove know, deterrence can be a tricky business. The complexity of deterrence and the lack of attention that has been paid to its social effects have too often left one of its forms – nuclear deterrence – depoliticized, uncontested, and thus a danger to us all. I argue in this article that speech act theory can provide insights into deterrence and its concomitant political effects. It can be used to philosophically explain the communicative difficulties involved in deterrent relationships, and to form a basis for a critical stance on deterrence as politics. This entails a shift of focus from deterrence as a state of mind to the politics of deterrence and the deontic powers it wields – a shift from the causative aspects of deterrence to the deontology of deterrents. The analysis of such political functions is aided by the neologism of deterrentification, which refers to assertive and declarative acts that alter the status functions of things so that they are thought to act as deterrents and bring about determent in someone or something. It also aids in conceptualizing how the status of deterrents can be cancelled, and how nu- clear weapons can be drawn away from the exceptional sphere of deterrence and back into the sphere of politics. Such a status transformation is required to achieve a sustained nuclear disarmament. The article compares the Eastern Neighbourhood policies of the two founders of the Eastern Partnership (EaP), Poland and Sweden. It focuses on the two countries’ approaches towards Ukraine during the preparations of the EU-Ukraine Association Agreement (AA) in late 2013. The article argues that while both Sweden and Poland have a strongly value-dri-ven approach towards Ukraine, their foreign policies are guided by two different under- standings of values: a liberal and a communitarian understanding. Sweden’s foreign policy, which is based on liberal values, focuses on the promotion of certain ‘universal’ norms connected to human rights, democracy, and good governance in its neighbourhood, of- fering assistance in reforms to those countries which show commitment to these norms. By contrast, Poland’s approach towards the Eastern neighbourhood is guided by a communitarian understanding of solidarity and ‘kinship duty’ based on perceptions of a com- mon heritage and a shared regional identity. From the different understandings of values follow different logics of action. For Sweden, Ukraine’s inclusion into the EU’s institutional structures, e.g. through the AA, is conditioned on Ukraine’s democratic performance and approximation to European standards. Poland, on the other hand, views Ukraine’s inclusion into EU structures as a precondition for the country’s success in reforms. Because of these different logics, the EaP at large, which is shaped by both liberal and communitarian val- ues, entails intrinsic tensions. These tensions are arguably more problematic than tensions between values and interests, to which scholars often attribute the EaP’s shortcomings. Considering the differences between the superficial orderliness of the English/British table of royal succession and the apparent anarchy of its Bohemian counterpart, this essay ques- tions aspects of the analysis of English state formation offered in Philip Corrigan and Derek Sayer’s 1985 study The Great Arch: English State Formation as Cultural Revolution. Rather than providing a contrast to England’s institutional political continuities over centuries, Bohemia’s manifestly fractured history furnishes a vantage point from which the ideological character of such claimed historical continuities becomes clear. E. P. Thompson’s image of a “great arch” of state formation attributes far too much shape, solidity, and coherence to a process that was always, whether in England or Bohemia, a matter of flux and fluidity – a landscape in constant erosion, upon which coherence is only ever imposed in momentary retrospect.